AUTOSAR Blockset provides an AUTOSAR dictionary and blocks for developing Classic and Adaptive AUTOSAR software using Simulink® models. You can define AUTOSAR software component properties, interfaces, and datatypes, and map them to existing Simulink models using the AUTOSAR editor. Alternatively, the blockset provides an application interface that lets you automatically generate new Simulink models for AUTOSAR by importing software component and composition descriptions from AUTOSAR XML files. AUTOSAR Blockset provides blocks and constructs for AUTOSAR library routines and Basic Software (BSW) services, including NVRAM and Diagnostics. By simulating the BSW services together with your application software model, you can verify your AUTOSAR ECU software without leaving Simulink. AUTOSAR Blockset supports C and C++ production code generation and AUTOSAR XML file export (with Embedded Coder®). It is qualified for use with the ISO 26262 standard (with IEC Certification Kit). Model AUTOSAR Classic and Adaptive Software Components by configuring AUTOSAR properties, and map Simulink elements to AUTOSAR specifications. 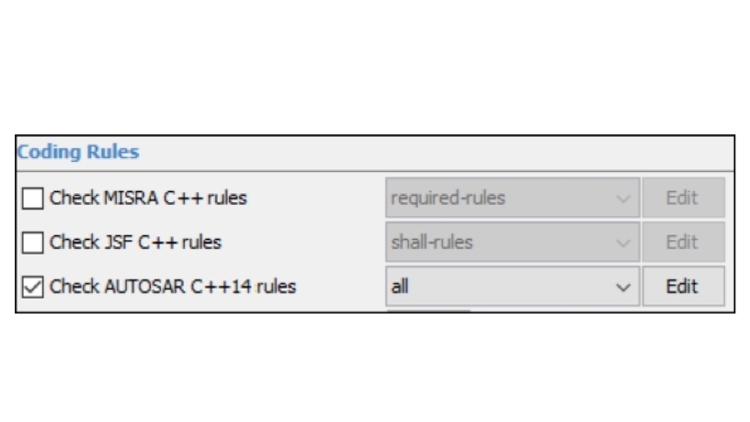 Automatically create an AUTOSAR Classic software component with default AUTOSAR ports, interfaces, and other configurations in Simulink. Model AUTOSAR Classic software components. 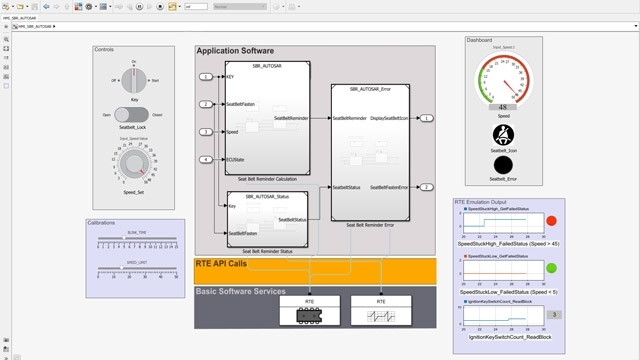 For AUTOSAR Adaptive platform, use AUTOSAR Blockset to automatically generate software components with default AUTOSAR ports, service interfaces, and other configurations in Simulink. Model AUTOSAR Adaptive software components. Edit and map the advanced AUTOSAR properties for both AUTOSAR Classic and Adaptive models using the AUTOSAR editor and dictionary. Model and simulate AUTOSAR software components and compositions together with Basic Software (BSW) services. Create AUTOSAR software compositions from software components using model references. Visualize the behavior of the compositions with Dashboard blocks. Simulation of compositions including input controls and Dashboard blocks. Use blocks and constructs for BSW services, including NVRAM Manager and Diagnostics Event Manager, to simulate BSW services together with your application software model. 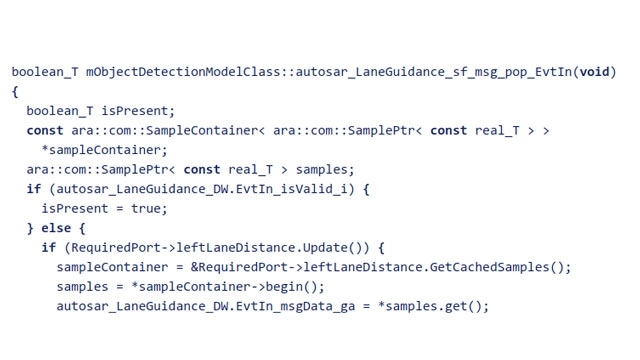 Verify your AUTOSAR ECU software directly in Simulink. Model and simulate the behavior of compositions within Simulink. Optionally perform back-to-back testing workflows for AUTOSAR composition models with Simulink Test™. Develop AUTOSAR software components using bottom-up, top-down, and round-trip AUTOSAR architecture and design workflows. 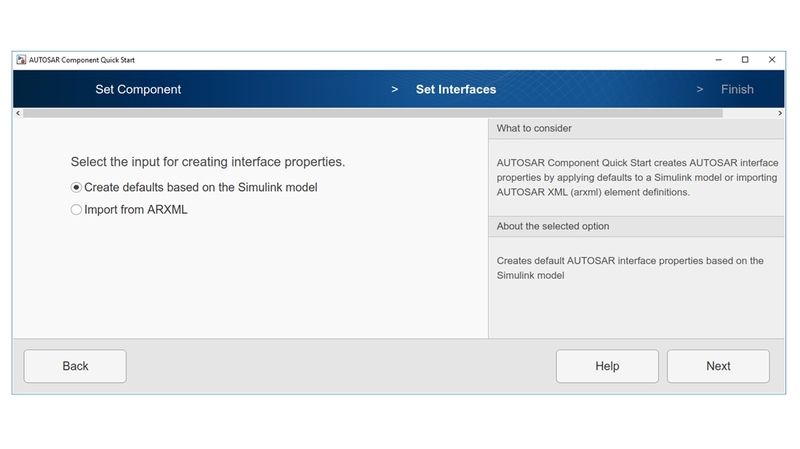 Use an existing or newly created Simulink model and configure it for AUTOSAR using the AUTOSAR Editor. Then use Embedded Coder to generate ARXML files (a bottom-up AUTOSAR workflow). 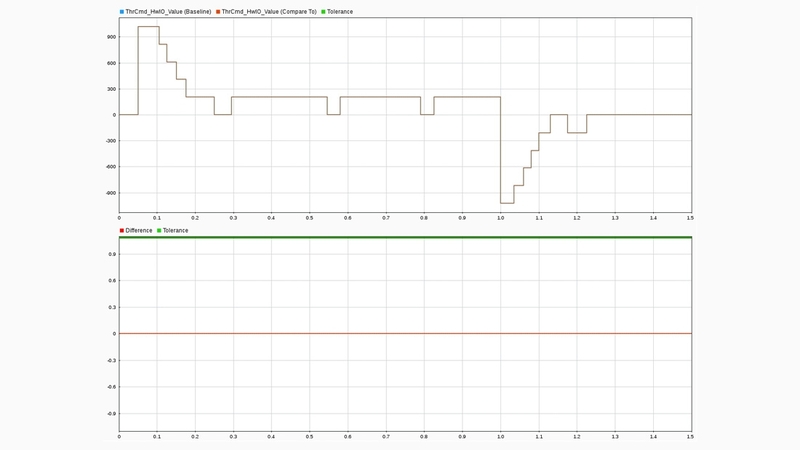 Using the AUTOSAR Component Quick Start tool to configure AUTOSAR properties. Import ARXML files from an AUTOSAR authoring tool as Simulink components and composition models. Then model the detailed design in Simulink. Update the model when updated ARXML files become available (a top-down AUTOSAR workflow). Update Simulink model configured for AUTOSAR, export updated ARXML files, and merge into the AUTOSAR authoring tool; export updated ARMXL files from the authoring tool, then import ARXML files to merge architectural changes in the Simulink model (a round-trip AUTOSAR workflow). Iterating between the Simulink model and AUTOSAR Architecture. 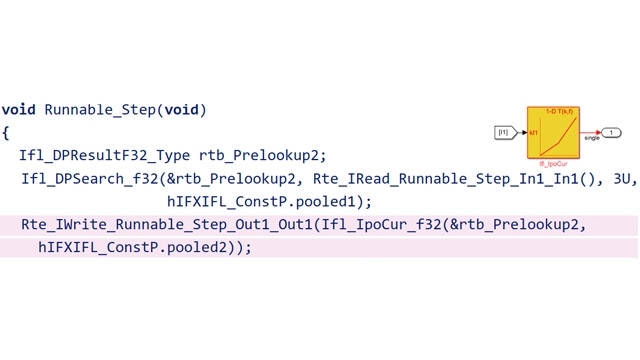 Generate and verify production C and C++ AUTOSAR code. With Embedded Coder, generate C/C++ code and AUTOSAR XML files. Perform SIL and PIL tests with the code for verification. Use preconfigured AUTOSAR blocks and code replacements to generate optimized library routines for AUTOSAR Classic applications. Qualify Embedded Coder generated code for ISO 26262 with IEC Certification Kit. Verify your generated AUTOSAR code for MISRA-C compliance, check for run-time errors, and look for mismatches between the code and AUTOSAR ARXML descriptions using Polyspace Code Prover™. Generate code for ISO 26262 with IEC Certification Kit. The new AUTOSAR Blockset is available with MATLAB and Simulink for model simulation. Embedded Coder is required to generate AUTOSAR C/C++ code and XML component descriptions for AUTOSAR Classic and Adaptive Platforms.